I’ve been putting off writing this post for a few weeks – for a couple of reasons. If I’m truthful (and I am! ), the first reason is that I didn’t want to write this post. The second reason is that I’ve been so incredibly busy wrapping up last-minute details for our annual Digital Summit (people…registration deadlines are not meant to be a suggestion!) that I haven’t really had time to sit down and give this post proper attention. Thankfully, the conference was wildly successful (based on the feedback that I received), and I can get back to “She Ordered What?! ?” business! As I start to go into my carb coma from The Mac Shack’s “Papa Smurf” mac ‘n cheese I devoured tonight, I decided I should finally share this lackluster dining experience. If you missed my post about The Mac Shack, please find it here. 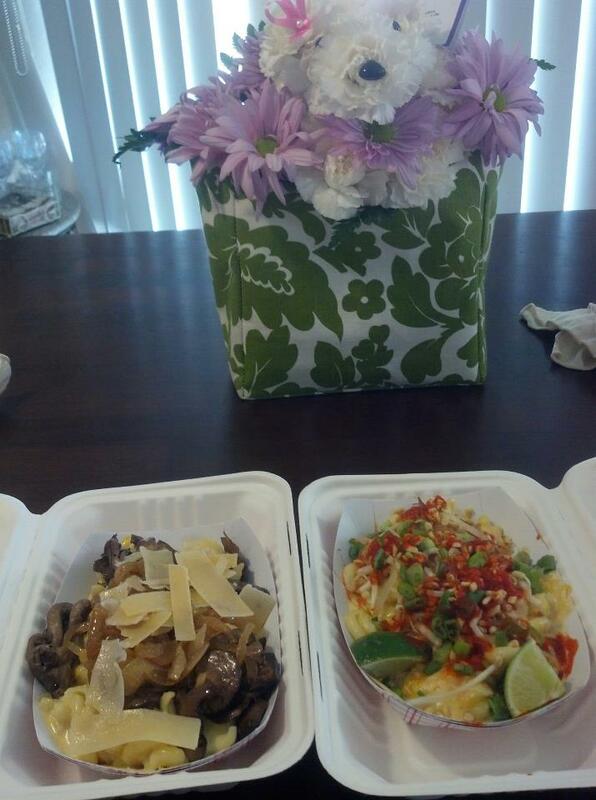 And, for reference, here’s a picture of the “Papa Smurf” and the “Koh San Road” mac ‘n cheese dishes. 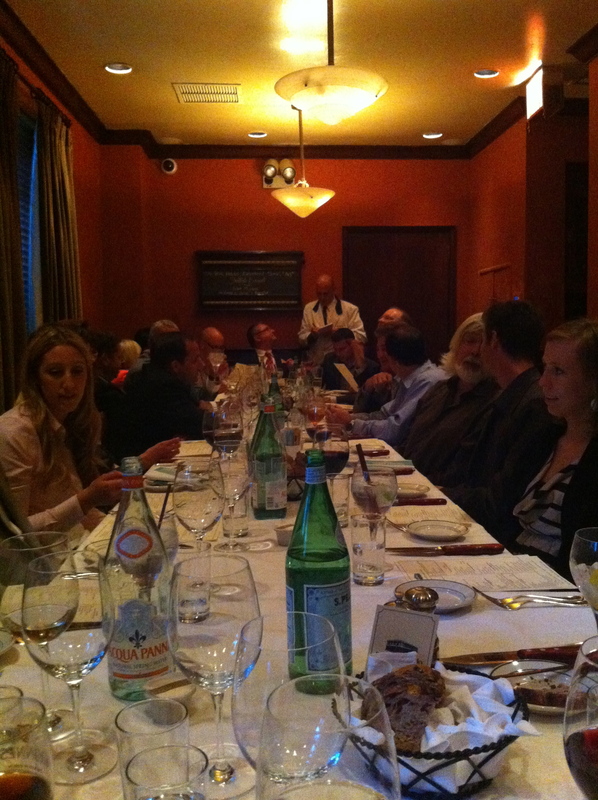 While I was in NYC, which I wrote about a few weeks ago, I had a business dinner with ~40 other folks who were at the Forrester Research client dinner. The group was full of terrific people – I really enjoyed the company and the associated conversations. A wonderful group at dinner! 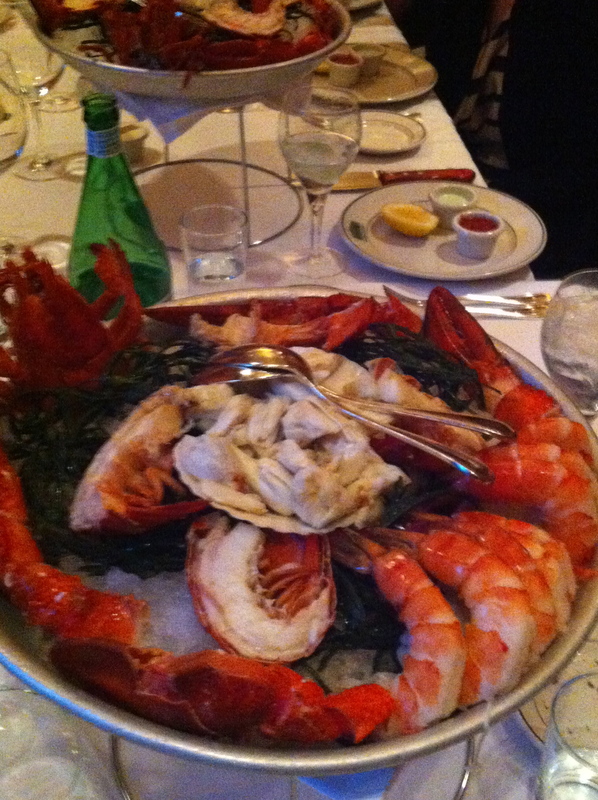 The only downfall about the evening is that the food was not properly prepared, and was a quite a let-down. Now, proper disclaimers: we were a large group, we went to a chain restaurant, and it is a steak joint, so my expectations were really not set too high. 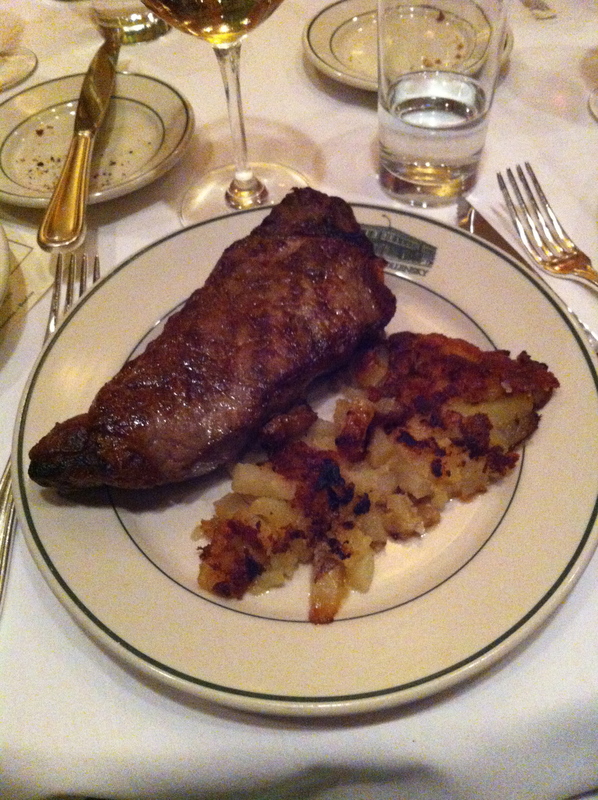 That said, Smith and Wollensky really dropped the ball, in my opinion. I handed the waiter, Carl, my blog card. He read it, and acknowledged my request. After sharing several platters of shellfish, onion rings, veggies, and salad, Carl and his coworkers began to deliver our entrees. A plate with a rib eye was placed in front of me. I’m not a huge steak connoisseur, but I was surprised that Carl chose a rib eye. In any case, my request for beef is to have it prepared medium-rare. The steak I received was medium/medium-well (medium-well, I’m being honest again!). Not much flavor, and not prepared to order – but not the worst of it! At least my hash browns were pretty tasty! 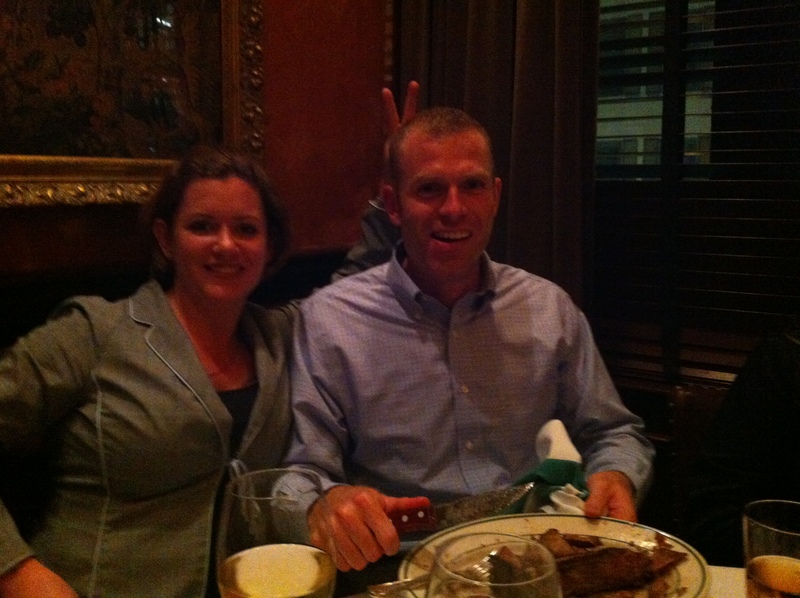 What was worse was that my dinner companion to the left, my Forrester Account Manager, Matt, had ordered a medium-rare Porterhouse, and was served a WELL done steak that had essentially been butterflied. Matt and Sue (a firecracker of a woman!). I gave him a portion of my steak, to hold him over while the restaurant prepared a new steak for him. To my right that night, two of my dinner companions had ordered medium and medium-well filets, respectively. The steaks came back RARE (bleeding!) and medium rare, respectively. (I would have gladly exchanged my steak for one of those!) Seriously, not one person received dinner the way he or she had requested. Again, we were a big group, but this was ridiculous! I do wish that we had a better dining experience – to go with the fantastic social experience we had! 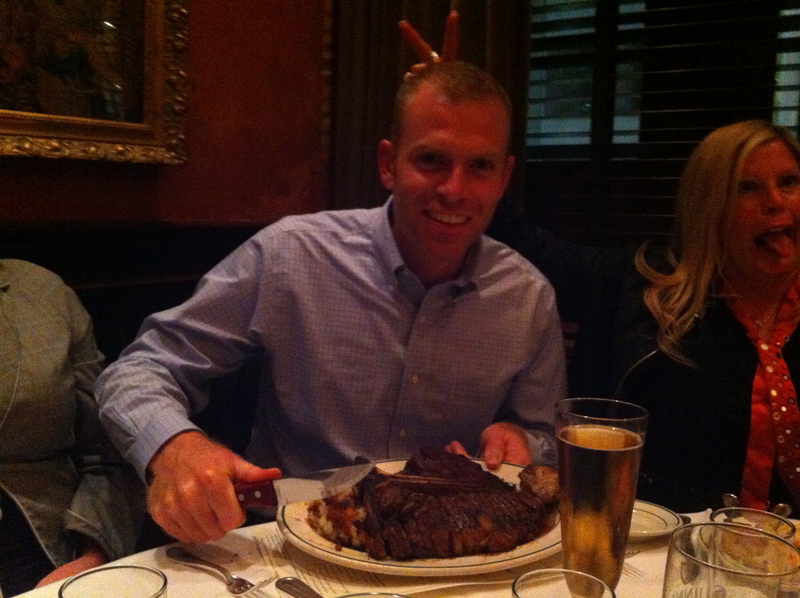 One of the “positives” (I guess…) is that Matt did indeed polish off the second Porterhouse he was served that night! And, he lived to tell about it – he and I had lunch the following day and he claimed he felt just fine. Amazing! 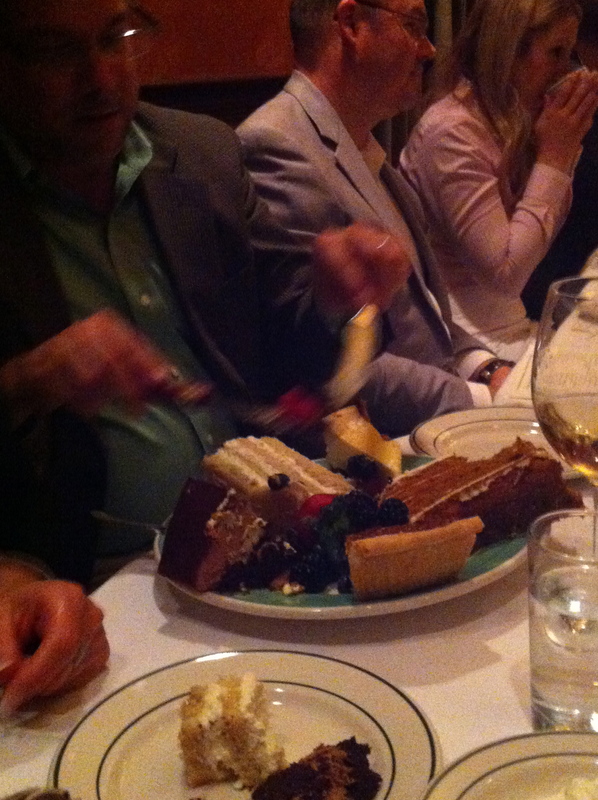 Another positive is that we all shared several wonderful desserts. It took some major prodding to get me to taste some pecan pie, but I’m glad I did. It’s one thing I really miss about living in the South. I have experience in the catering and general restaurant business. I know it’s tough to deal with larger groups. 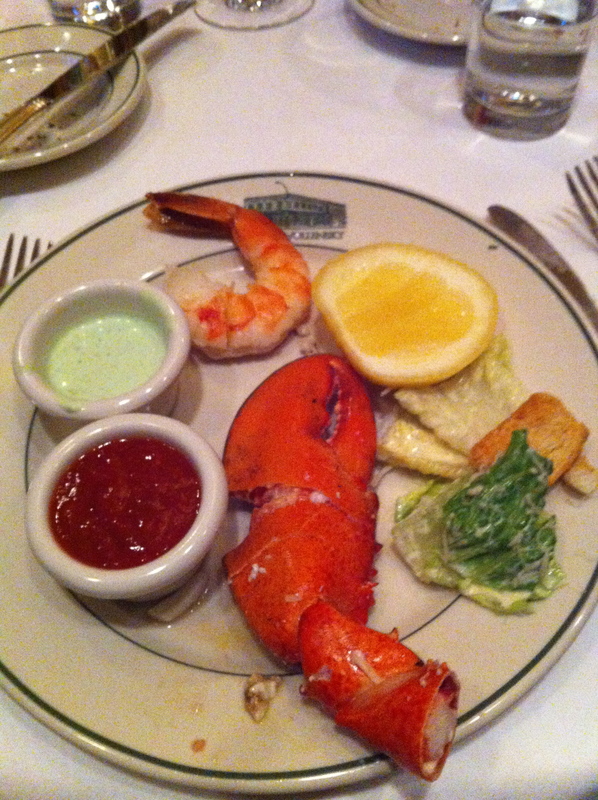 What we experienced at Smith and Wollensky’s was pretty darned disappointing, IMO. And, Carl’s choice for me was disappointing as well. With my only exceptions being maple syrup and scallops, I think he could have found a better option than an ill-prepared and non-descript rib eye. I hope the rest of the team had a great social experience – like I did. And, I hope we have a better dining experience next year too!